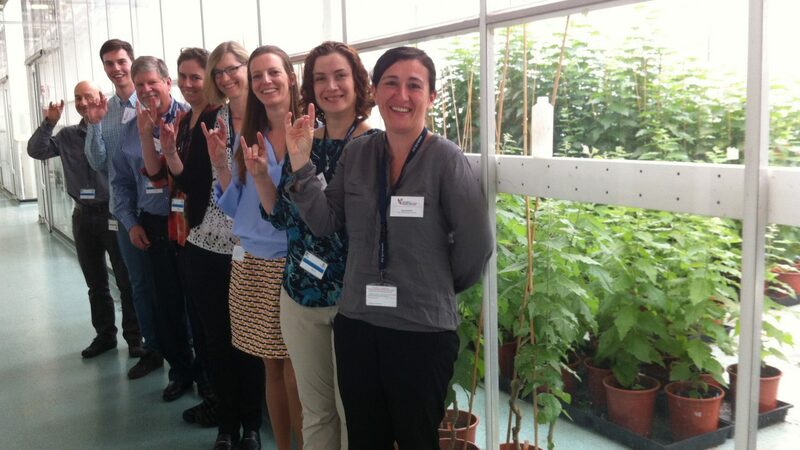 NC State scientists toured greenhouses and other VIB facilities in Belgium. 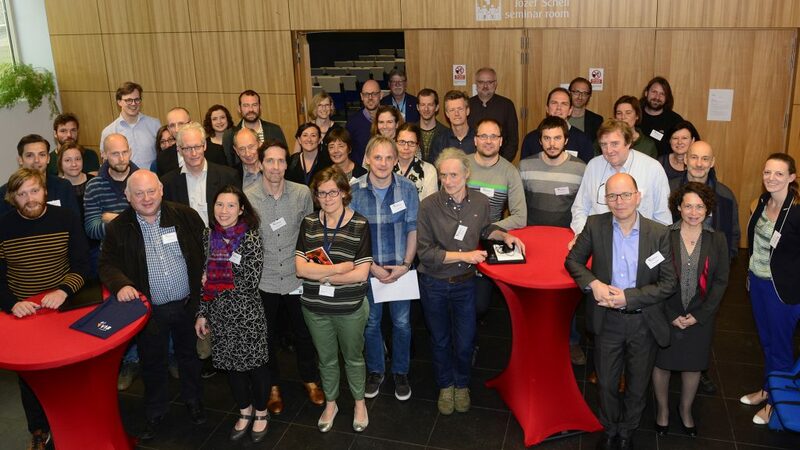 From left to right: Jose Alonso, Nick Vangheluwe (VIB), Steve Lommel, Colleen Doherty, Amy Grunden, Marieke Louwers (VIB), Lina Quesada and Ross Sozzani. Partnership Impact: NC State and VIB scientists worked with other collaborators around the globe on a major study published in the journal Nature this month. The study focused on the tightly choreographed interplay of proteins, hormones and microRNA at work as plant roots grow. Read more. The plant science partnership formally forged last year between NC State University and a key European research institute is growing. On May 11-12 representatives from NC State’s College of Agriculture and Life Sciences traveled to Flanders, Belgium, to share their research and gain insight from their counterparts with VIB. CALS’ Director of Research Partnerships Deborah Thompson said the goal was to begin creating opportunities for collaboration that lead to sustainable, affordable approaches to feed the world’s growing population. During the visit, Thompson learned about VIB’s entrepreneurial engine, while five CALS faculty members — Colleen Doherty, Ross Sozzani, Lina Quesada, Jose Alonso and Amy Grunden — met one-on-one with VIB researchers. The workshop also included networking, tours and formal scientific presentations. Emphasizing areas where the resources of NC State and VIB can complement each other, the tours included a view of VIB’s state-of-the-art microscopy lab and an introduction to VIB’s ability to complete high-throughput phenotyping with specialized equipment. Phenotyping involves assessing how the genetic makeup of a plant adapts and reacts to the environment to produce complex traits such as growth, stress tolerance and yield. VIB researchers can perform phenotyping under controlled, greenhouse, conditions at a high level of volume and precision, but the institute’s field research opportunities are limited. Researchers at NC State, on the other hand, have access to ample resources – including a network of agricultural research stations — that allow them to perform high-tech field research, collecting phenotypic data under field conditions. By working together, researchers at VIB and those at NC State can make great progress in discoveries that will lead to a future food supply that is safe, widely accessible and affordable, Thompson said. 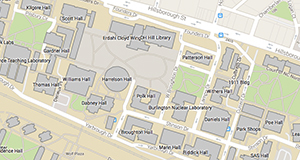 Both VIB and NC State are located near important agriculture research companies, VIB through Ghent Science Park and NC State through Research Triangle Park. On the first evening of the workshop, representatives from various companies met with the representatives from both institutions. “These opportunities for widening network connections will also benefit researchers at both institutions, especially with regards to collaboration and research funding,” Thompson said. Steve Lommel, associate dean for research, led the CALS delegation. He said that VIB and NC State will continue to maintain a productive collaborative relationship as scientists at both institutions delve deeper into plant biotechnology research. “As NC State seeks to become a world leader in plant biotechnology with the North Carolina Plant Sciences Initiative, working closely with other innovators in life sciences, like VIB, will become increasingly important, especially since the Plant Sciences Initiative will emphasize collaboration across disciplines in its model of an extraordinary research institution,” Lommel said. The next workshop will be held in Raleigh, at NC State, this fall.